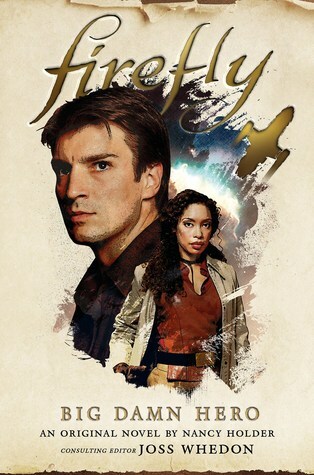 I don't usually read tie-in fiction because I usually find that on some level it disappoints, however right from the get-go Nancy Holder (and James Lovegrove) capture the spirit of what is possibly my all-time favourite TV show by my all-tine favourite TV writer, Joss Whedon. The trick to Joss Whedon's writing (if you can call it a trick) is to delve deep into character while turning up the comedy one-liner-quotient to eleven, and all this while not losing sight of the drama and plot line. His writing is a tour-de-force whether you're looking at Firefly and Buffy the Vampire Slayer or the fabulous one-liners in Toy Story 1 (Whedon was the script doctor.) I didn't expect Whedon to write his own tie-ins. He's somewhat busy with – y'know – directing major movies, but I do feel that the authors mostly capture Whedon's spirit, especially at the beginning of the book. This Firefly adventure is pretty much like watching an episode and covers approximately the same type of ground. It's set part way through the first and only season, more towards the latter end. The major characters are all assembled. River is still wambly in the brain-pan; Simon still hasn't made a pass at Kaylee; Zoe and Wash are happily married, and Jayne has the knitted hat and a gun called Vera. Mal is his usual cynical self, but he can't afford to turn down a job, which is why they all find themselves on Persephone's Eavesdown Docks getting ready to transport crates covered in warning stickers (as in warnings of imminent explosion should the crate be rattled, wet, warmed up etc.) Maybe they shouldn't have taken another job from Badger, but they need the cash to keep flying (presuming he pays them this time). Oh, yeah, this is gonna be great! Badger's job (transporting unstable mining explosives) is one thing, but when Mal is kidnapped he ends up being tried in a kangaroo court as a traitor to the Browncoats while his crew follows every clue available to trace him. There's some interesting backstory from Mal's youth on Shadow, before the war, which I assume can be taken as canon since this is an official tie in.